Thank you to colleagues who kindly volunteered to be a ‘dining companion’ this week, serving food to patients at mealtimes on wards at QMC and City. 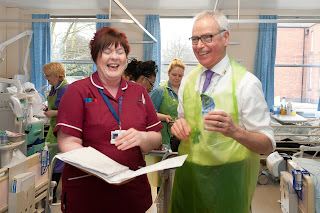 It is a pleasure to spend time working alongside colleagues who strive to deliver the best possible patient care. My shift started at breakfast time on FlemingWard. The first meal of the day for patients was meticulously co-ordinated to make sure patients get their dish of choice. Staff do all they can to ensure patients get the appropriate nutrition and hydration, which is an essential part of their recovery. Without good nutrition and hydration, patients are more likely to stay in hospital longer. Our busy ward teams each work hard to make sure patients have a good meal to aid their recovery and make them feel better. Our recent CQC Report endorsed this. I was pleased today to see this in action. Thank you to colleagues from across NUH who have supported Nutrition & Hydration week, which is an important part of our Trust-wide patient safety programme.